When you think of a learning space in a school, do you automatically think of desks, blackboards and textbooks? As the world changes and the way we deliver and receive content changes, why do so many of our schools continue to look the same? My classroom is a collaborative environment, where problem solving, questioning and feedback is encouraged. Gone are the days where you could hear a pin drop in a classroom. My classroom is noisy, full of energy and always changing. My students choose where they want to sit, choose who they want to work with and what tools they want to use. I needed my learning space to reflect that. Last year I spoke to my teaching partner about changing our classroom. She was all for it, so the first thing we changed were the desks. We were able to swap out our desks for tables. We used furniture that wasn’t being used in other buildings in our district and traded them for our desks. The second thing I wanted to change was our meeting area. We had a large carpet for the students to gather on. (We have 40 students.) I made a few milk crate stools, my mom donated a large ottoman and we had two high bar stools that sat at our observation window to view our bird feeders. The students chose the non traditional seating over their tables every time. They loved working together seated on the ottoman or around it. They loved reading and collaborating on the high stools. I don’t think the furniture increases learning directly. However, I believe your mood does. When you are comfortable and happy it contributes to your productivity. 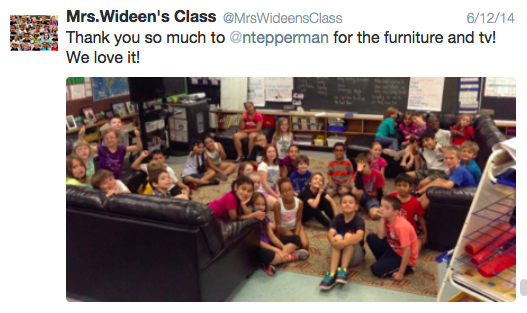 As a result of this, last August I tweeted to our local furniture companies asking them to donate furniture to my classroom. A couple of the companies responded asking me to email them. I did and one local company was eager to hear my story. A meeting was set with Noah Tepperman. He is the Director of Social Media and a Partner of Tepperman’s Furniture store. When we met, I told him about our space and that my students did most of their learning on an iPad. I explained that we were looking for a more comfortable space for not only my students but their parents as well. On Tuesdays and Thursdays for the first half hour of the day the families of my students are invited to come in and read with them. This has evolved since we received the iPads. Students now read or show their families work they have done on the iPads. Our guests always had to go into our library because we didn’t have enough seating to accommodate our families. After meeting with Noah, he came and visited my learning space and spoke to my students. We then met one last time to look at furniture for the space. This past June, 2 large sectionals, an ottoman and a 50 inch flat screen were donated to our learning space. The new learning area provided by Mr. Tepperman can accommodate around 20 children comfortably and we can now use our Apple TV to share the students’ work on our new TV. The students love our new space, reading time is a lot quieter, work time is a lot more comfortable and parents feel welcome to join our classroom. 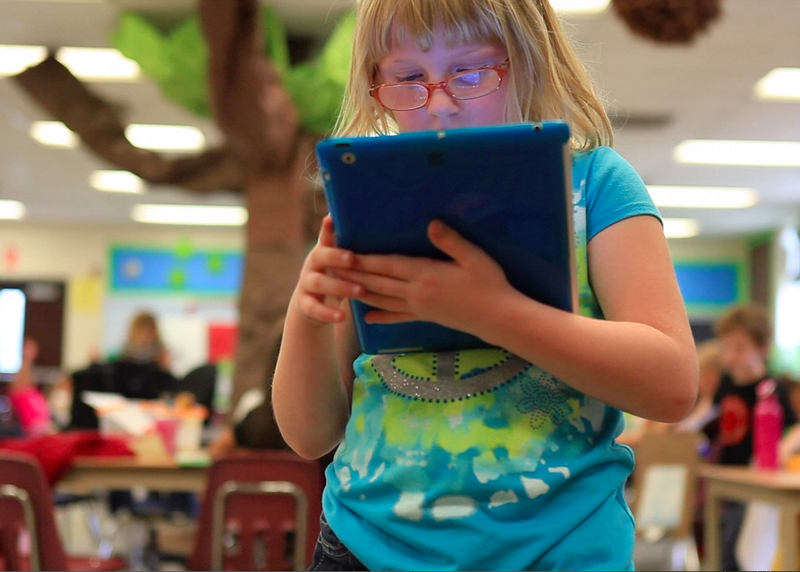 Why can’t our classrooms look closer to our homes? I know that when I’m reading a book or doing something on my iPad, I don’t sit at my kitchen table. I sit on my couch in my living room. When you start getting ready to go back to school next month, think about your learning space. Do you have different areas in your room that are meant for different tasks? Do you have quiet areas to get away with a book or to do something independently? Do you have other areas where seating can easily be rearranged to meet the need for collaboration? Do you have any non-traditional seating, if not, can you get some? 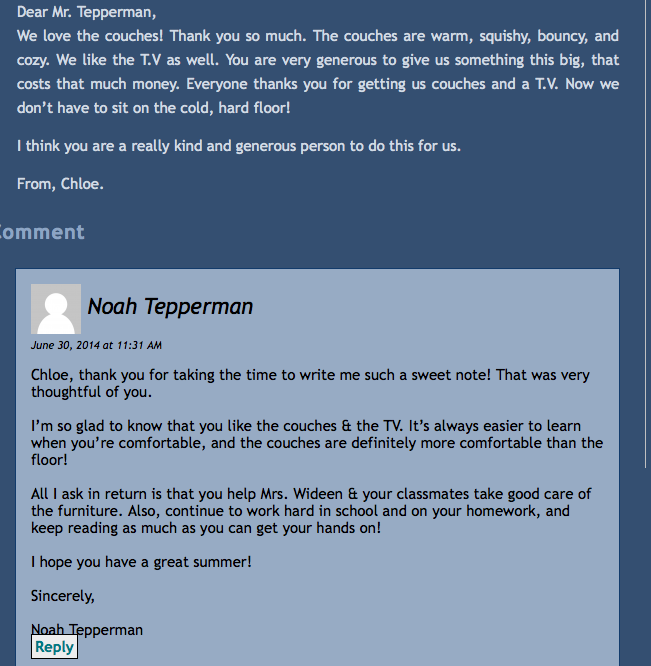 Hopefully you can find someone as generous and genuine as Noah Tepperman to make that a reality. Thank you Noah for the amazing donation and for taking time out of your busy schedule to visit my class, and to comment on their blogs. My students and I couldn’t be more happy with our learning space!